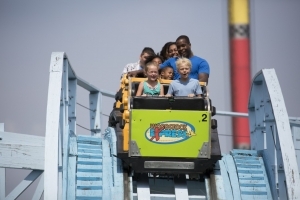 Whether you want the thrills of a rumbling roller coaster or the relaxation of a poolside cabana, Kings Island in Cincinnati, Ohio, has something for everyone. 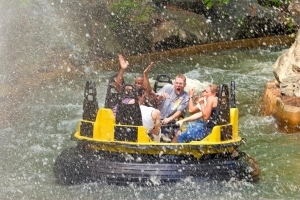 Experience the hair-raising thrills of The Beast, take a spin on the Scrambler, or go on an exhilarating journey on Congo Falls. When you’re running low on fuel, you can stop by one of several in-park dining options. Grab a snack with Auntie Anne’s or Cinnabon, then cool off at Calypso Coolers. Subway, Starbucks, and Chick-Fil-A are available throughout the day. Dining plans and drink passes are available for pre-purchase to take the guesswork out of your trip. When you’ve had all the thrills you can take, visit Soak City. This premier water park offers slides, rides, and relaxation for the whole family. Play at Castaway Cove, check out your surfing skills at Pipeline Paradise, or relax under a cabana while you soak up the sun. Splash River, Soak City’s lazy river, is perfect for kicking back, and kids will love the Splash Landing play area. For water fun the whole family can enjoy, check out the Zoom Flume or Mondo Monsoon. These giant raft rides allow up to four family members to ride together. Get Kings Island discount tickets when you book your next trip with aRes Travel. Ticket options include an admission and drinks combo. This unlimited-drinks wristband allows you to get free refills throughout your visit. Pre-purchase your daily parking pass and bundle your tickets with a stay at a local hotel to create a convenient and affordable vacation package. For exclusive Kings Island discount tickets, the greatest deals on packages, hotels, and amazing savings on travel, call 1 (800) 434-7894 (international callers use +1 (619) 546-5622) to speak with an aRes Travel planning expert seven days a week, or book online now.